PNP bipolar power transistor, TO-218 (SOT-93, TO-3P) case. Rated at 100v, 25a. 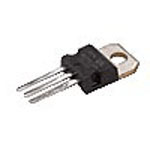 Large, heavy-duty transistor for use on many high-current devices including Fliptronics flipper boards in Bally/Williams games, PPB boards in Data East and Sega games, and special solenoid/magnet devices on many various games.